I’d never really looked at the bill before, beyond figuring out how much to pay. But this time I took a harder look. With the drive to conserve I was expecting clear information on the bill to help me understand how our household is doing. How wrong I was. All you get is the number of gallons a day: 162. So is that good? Bad? Indifferent? How does it compare to last year? To my neighbors? To what an efficient household would look like? At first it had me pulling out my phone and searching the web for comparisons. But to be honest, that’s not much help as different countries and regions use different metrics. What I wanted was something relevant to where I live. In the end I turned the bill over and in small print it tells you how to compare water use. Bingo! Again, wrong. First up I’d need to know whether the bill was for the “winter indoor use” period or not. It let me know that 45 gallons per person per day is considered “efficient” and 35 gallons “super-efficient” for indoor use. Outside the winter use period, I’d also have to calculate my outdoor allowance by measuring the area of lawn and shrub. Each 100 sq. ft. of lawn is multiplied by 12 (if I’m west of the hills) or 13 (east of the hills) and each 100 sq. ft. of shrub by 8 (west) and 7 (east). Sound complicated? You bet! First up, I was unclear if my bill was considered “winter” or not as it included part of December which it told me is the winter period. With Pinole being in the hills I was unclear whether I should use the equation for “west” or “east.” And since it was raining I wasn’t going to drag a tape measure outside to measure the area of shrubs. The lawn is easy. We have none. So in the end I kept it simple and focused on the indoor use comparison, which turned our to be 46 gallons per person per day. Just a shade over the efficient mark. I guess that good. I care about this stuff and I struggled. If we’re to get serious about conservation in California we need to make this simple and automatic. There’s no excuse that our water bills don’t come with comparative information. They don’t need to know how many people live in each home, but it would be easy to include a quick table that did the calculation for you. When I see these type of changes I’ll know that conservation has become a way of life for my water company. Come on East Bay Municipal Utility District – I know you can do better! Do you have any good examples of water bills you can share? How will climate change affect California’s park visitation? This year’s warm and dry winter is expected to become the norm in the future. Over the past few weeks, I’ve spent time up at Tahoe and most recently among the north coast redwoods. My anecdotal observation is the weather this year is already affecting tourism and our public agencies have yet to catch up. The lack of snow in the mountains drove people down to the lake shore where the visitor facilities remained closed for the season. At the Emerald Bay overlook, the parking lot was closed and cars were double-parked along the road causing a traffic jam in both directions. While the parking lot for Vikingsholm was open it was as busy as I have seen it during the summer. The house itself was closed and there were no park staff to be seen to greet the hundreds of visitors. Up on the north coast, the Prairie Creek campground was partially open — and already full by late afternoon. The camp hosts told me they’d be turning people away rather than opening up the second loop as the maintenance crews hadn’t got in yet to open up the additional campsites. If this year is repeated and becomes the new normal, our public agencies are going to have to change the way they manage the parks. We’ll have to be nimble enough to open them up earlier in the season as the weather, and visitors, demand. More park visitation is perhaps one bright spot in an otherwise bleak future. 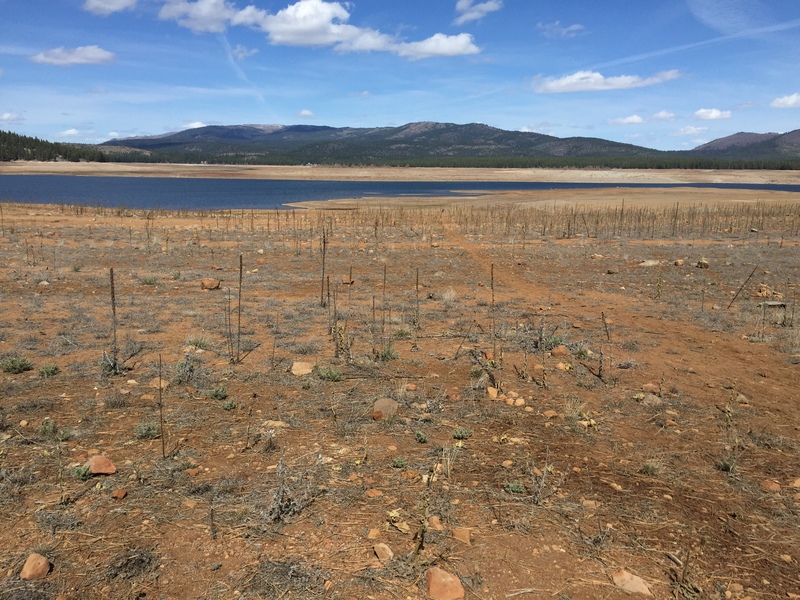 It took snow pack levels to drop to 5 percent for the State to finally mandate water conservation. They are targeting a 25 percent reduction in water use across the state. But what does that mean for the average residential user? Unfortunately, I think it may mean not much. After all, we’re used to reading that the biggest water users are agriculture. Can’t we just let the farmers growing almonds in the Central Valley or alfalfa in the desert figure this out? They can do there part, and my part as well? While that is easy to say, It also sends the wrong message. It’s incumbent on all residential users to do our part before we turn and say others should. And that’s where I start to get hung up. What can I really do to reduce my own water use by 25 percent? In other words, for every 4 gallons I use today I need to use 3 tomorrow. I live in a small rental with no lawn and no dishwasher. So I can’t turn off the sprinkler and wait until the dishwasher is full to run it. My car is already dirty and on the rare occasion it gets washed, it’s at the local car wash that recycles its water. I’m not one for singing in the shower and if I started to shower only every other day people may complain — especially on the days I go for a run! And beyond all of this, even if I do figure out how to reduce my usage. How will I know? The good news is I live in a city with water meters. The bad news is it is buried in the sidewalk, beneath a heavy inspection chamber, covered in dirt and gunk and uses a series of hard-to-read dials. When the bill finally arrives, it’s months out of date. If the state is serious about residential users cutting their use by 25 percent that has to change. Give me a smart water meter that I can read using my phone and I’ll then have the tools I need to translate my actions to the savings. Until then, I am afraid that as well meaning as I am, I am really flying blind on all of this. And believe me, I hate to say that having worked in and around water and conservation issues for years. Last week, Mayor Eric Garcetti announced some bold initiatives for the city of Los Angeles to address the ongoing drought. In brief, he’s calling for a 20 per cent reduction in use of fresh water by 2017 and more ambitiously to curtail the purchase of imported water by 50 per by 2024. The second number really got my attention as there’s a lot packed into that short sentence. Cutting the purchase of imported water by 50 per cent sounds bold. But it’s not as bold as it needs to be. And the twist is that the City actually owns a lot of the water it currently imports — water from the Owens Valley — hence it’s not being purchased. 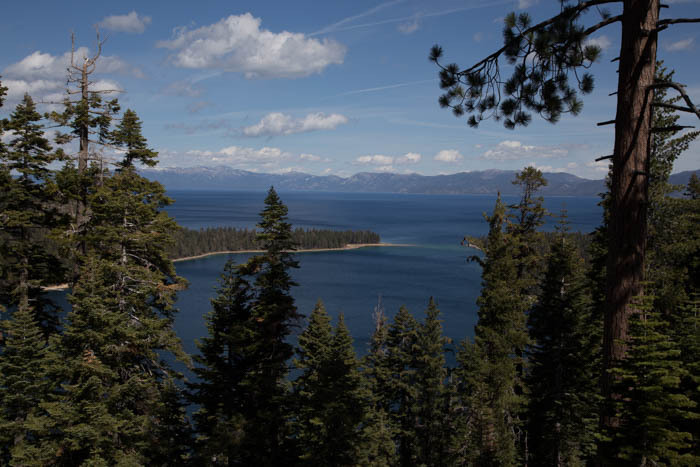 Between 2006 and 2010, water from the Owens Valley provided 36% of LA’s water, compared to 52% from the Metropolitan Water District which imports water from the State Water Project and Colorado River. The city already had a plan in place to cut MWD water to 24% by 2034. In effect Garcetti’s announcement accelerates the timeframe by a decade. That’s great. But look closer, and the original plan actually calls for an absolute increase in imports from the Owens Valley. It may make economic sense, but it doesn’t enhance resilience and doesn’t address the environmental issues the valley faces. In the face of global warming, what is needed is to move the city to much greater reliance on utilizing water resources local to the region and its watersheds. If the city could get to the point where 50 per cent of its water came from truly local sources it would be much more resilient from both the ravages of global warming, and the disruption from the big earthquake when it strikes. Currently the city imports 85 per cent of its water more than 100 miles. The three primary imports are from the western slopes of the Sierra Nevada (the State Water Project), the eastern slopes of the Sierra Nevada (the LA Aqueduct and Owens Valley), and the Colorado River. By and large all this water is the result of snow-melt. In the face of climate change this will diminish, threatening LA’s water supply and very future. In addition, all pipes cross the San Andreas fault, some multiple times. Modeling for a major quake on the San Andreas fault show that much of the disruption the region will feel is the result of loss of water as these pipes rupture. Can you imagine going without a shower for a week, let alone three months of a year? I can’t! Coincidentally, it is estimated that about 50 per cent of water is used outside for landscaping. So getting to 50 per cent truly local water means the city could survive without those imports for a while. I think most people would be prepared to let their grass die so they could take shower. Getting to 50 per cent truly local water is an ambitious goal for Los Angeles, but I believe it is the right goal. The city has the tools in place through its conservation programs, recycling programs, groundwater cleanup, and stormwater capture. What’s needed now is to take the Mayor’s bold plan and amp it up a notch. Then Los Angele’s will truly be building sustainability and resiliency for the future. Canals criss-cross the state bringing water to Los Angeles – how would these fare in an earthquake? I find the great Central Valley of California endlessly fascinating. 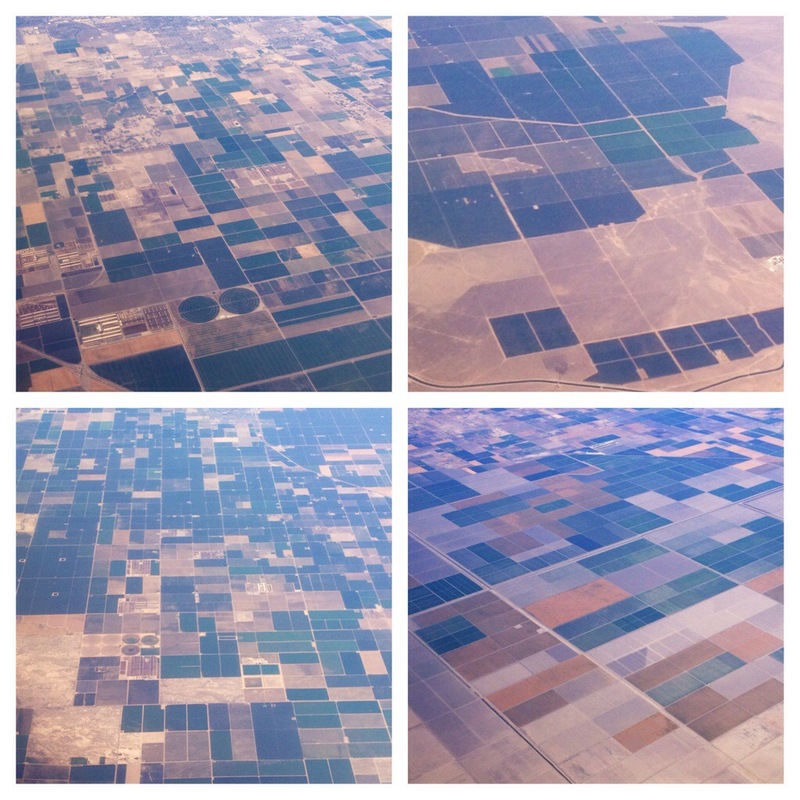 From the air the irrigated farmland becomes an abstract painting worthy of any gallery of modern art. At one time it was a vast grassland punctuated by reed beds and marshlands. No doubt home to countless animals. Over the past century it’s been tamed. It’s water captured and diverted. It’s grassland replaced by millions of acres of farmland that feeds California and the world. This year it’s parched as the dry Californian winter rumbles into a scorching summer. Down below farmers are struggling as water dwindles. But from above it retains it’s abstract beauty. 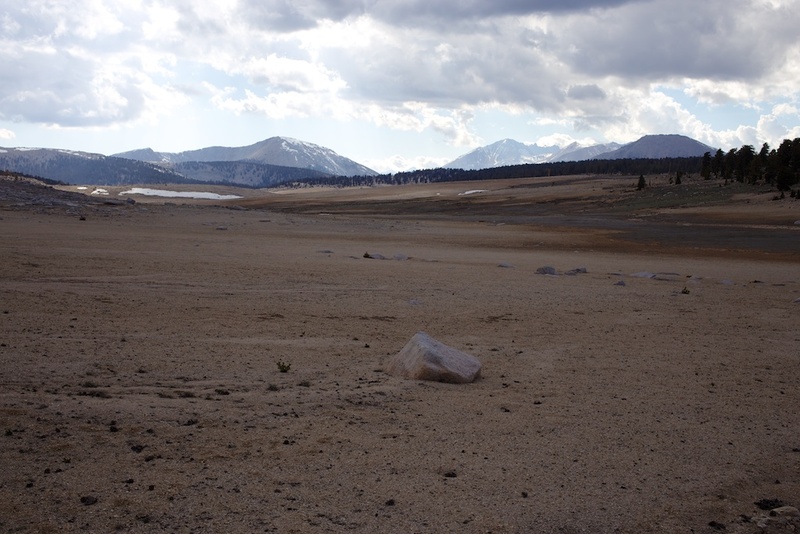 High up in the backcountry of Sequoia and Kings Canyon National Park and the Golden Trout Wilderness the drought is taking hold. I spent most of Memorial Day weekend above 10,000 feet. The snow has largely gone, the wild flowers are almost non existent and the barren bones of the Sierra Nevada are laid bare. The Big Whitney Meadow and the aptly named Siberian Outpost are starkly beautiful, even if they lack the flush of spring that normally visits the Sierra at this time of year. It really brought home to me that we’re in the midst of a vicious drought. Not only have we lost the snow pack, but the water that is normally stored in these high alpine meadows is also dwindling. I was a visitor. But it’s going to be a long hot summer for the golden eye trout and marmots that call these meadows home. [This is from a guest-blog I wrote for the LA Stormwater Program’s web-site, published April 22, 2014]. I’d been living in Los Angeles for about six months when a three-day storm hit back in February. I had begun to wonder what all the fuss was about stormwater. Could it really be that bad? Now I know the answer is yes—but not just for the pollution it causes. I was delighted by the waterfalls that popped up in Topanga Canyon. I was saddened to see the torrent of trash flowing down Chautauqua into the ocean. But what really shocked me was when I learned that the three-day storm, in the middle of an historic drought, flushed enough water into the ocean to meet the needs of our region for one-quarter of a year. That’s crazy. At a time when cities in Northern California face rationing, and farms in the Central Valley lie fallow, we are flushing billions of gallons of water into the ocean. That same water is causing huge environmental problems because of the trash, pathogens, and toxins it carries. There must be a better way. Fortunately, there is. There is a growing consensus across the region that stormwater is not just a pollutant, but a valuable source of water. Stormwater capture projects, when done well, deliver water quality benefits, water supply benefits, and bring much needed green space into our city. It is true that stormwater capture is not a panacea for our supply needs. But it is an important part of a portfolio of projects to increase local water reliability that includes water conservation, water recycling, and groundwater cleanup. Today we import 90 percent of our water from more than 100 miles away. At the same time, we dump 350 million gallons a day of treated effluent into the Santa Monica Bay from the Hyperion Treatment Plant, and discharge billions of gallons of polluted stormwater into the bay every time it rains. It’s past time to bring these three separate systems together and focus on an approach to integrated water in our region. There is some great work underway throughout the region to do this and to deal with stormwater pollution. For example, the Los Angeles Department of Water and Power’s Stormwater Capture Master Plan currently in development is looking at infiltration systems built into city streets and improved spreading grounds to refill our groundwater supplies. Countywide, projects are being developed under the MS4 permit to capture and clean up stormwater. More is needed to integrate these projects and look across agency jurisdictions, but that’s not the biggest challenge. What is missing is funding. In November 2004, voters in the City of Los Angeles approved Proposition O—the Clean Water, Ocean, River, Beach and Bay measure—with an overwhelming yes vote. In the past decade, Prop O has funded dozens of projects, including the restoration of Echo Park Lake and installation of thousands of trash capture devices in storm drains. But as of January 2014, almost $492 million of the $500 million bond was obligated. These projects are helping to get us on track, but there is much more to be done. Without new funding, the rivers, creeks and beaches throughout our region will continue to be polluted. With the increased consciousness caused by the drought, now is the time for some bold moves. We call on the state legislature to move a water bond that prioritizes investments in local water—including stormwater capture, water recycling, and groundwater cleanup. While they are at it, California lawmakers need to pass reforms that enable municipalities to more easily raise fees for stormwater cleanup. Why should stormwater projects have a higher bar than water supply or refuse pickup? At the local level, we call on our political leaders to prioritize funding for local water—either as stand-alone or part of other infrastructure measures. Pot holes may be an annoyance, but water is literally life and death. And at the community level, we encourage everyone to do their part—by conserving potable water and capturing stormwater through rain barrels and rain gardens and becoming informed about where your water comes from. It’s an exciting time to be working on water in our region. Join us and be a part of the future of Los Angeles. Precious water: what price waste? On Wednesday I joined Mayor Garcetti, Governor Brown and members of the President’s Task Force on Climate Preparedness and Resilience at a reception to kick off day-long talks about how the federal government can help communities confront climate change. And today in Fresno, President Obama is unveiling an aid package for communities hit hardest by the drought. Even as we address immediate needs of drought-stricken communities, we must also be moving beyond short-term aid, to investing in a water system for California’s future. And that presents historic opportunities for our work at Heal the Bay. Since 1985, we have been focused on cleaning up pollution in California’s waterways and ocean. We have had some remarkable successes. However, many of the state’s rivers and streams still fail to meet clean water standards and much of our ground water is polluted. There’s much discussion at the moment about how we “waste” water by dumping it into the ocean. Every time I hear that I cringe. While it is not a waste to let water flow to the ocean (it’s an essential part of the natural system that keeps us alive), it is a waste is to dump highly treated water in the ocean that could be reused to off-set dwindling imported supplies. And we do this every day from countless wastewater treatment plants. One plant alone, Hyperion out by LAX, flushes 250 million gallons a day of treated waste water into Santa Monica Bay – equivalent to the water needs of 2 ½ million people. That’s unconscionable waste! And then there’s storm water. When it does rain, millions of gallons of water flush through our cities via engineered culverts and channels, picking up pollutants in its rush to the ocean. In a naturally functioning system, much of this would infiltrate into the ground and replenishing our aquifers. Instead we are left with polluted beaches and depleted aquifers. Crazy! We cannot make it rain. But we can make much better use of the precious water we have. Today, Heal the Bay is advocating for solutions and investments that make better use of our local water resources – from groundwater clean-up, to storm water capture and recharge, to increased recycling. Taken as a package, they will go a long way to cleaning up our rivers, streams, and ocean. And that will make for a healthier bay. I’ll drink to that!